Waggiest Weekend - What's In Charlie's Suitcase? About time they let me write a guest blog right? It’s usually “Charlie pose like this. Charlie sit like this. Stay, stay, staaaaay. Here’s a treat but oh, you can’t have it yet.” Now don’t get me wrong, I love posing in front of the camera, but I’m not just a pretty face, I’m the Chief of bloody Barketing! Anyway, I digress and now is my time to shine. Before I get into the nitty gritty, I have to let you know (for legal reasons) that Lucky Pup Design are featured in this blog. That’s because they’ve helped to pack my suitcase with lots of lovely things. The blog is sponsored, but opinions and packing list is completely based on my own furry views. Picture this, the sun shining, lot’s of dog friends by your side, a guided walk in the woods and lots of happy humans. You come back to a thriving campsite, tasty treats, a cosy campfire, games and live acoustic music. Did I mention plenty of treats?! I’m describing the Waggiest Weekend at Top of the Woods. Don’t know what we’re talking about? Click here and take a look! When my pawrents mentioned they were taking me on holiday, my tail started wagging, and it hasn’t stopped since! After all, I’m a big part of the family! Who wants to stay at home when there’s fun to be had in the great outdoors right? After I thought about all the treats, walkies and potential bit of bbq meat I could get at the Waggiest Weekend, I started to think about what to take. After all, I’ve been to Top of the Woods once before so this time I could be a little more prepared. I’ve been searching the gram with my big ole ears to find some pawfect pieces to go in my suitcase. Lucky for me, I’ve been working with Lucky Pup Design who helped me to pick out the most ‘on trend’ pieces for this summer. I’m sharing what’s going in my suitcase and what essentials you should be taking too. I’ve even designed a prinatble checklist for you to download and use for your holidays! I know, I know – we love to run the fields and jump through the tall grass – but staying on the lead within the campsite is impawtant Dog Furiendly etiquette. Even if you’re the goodest dog off-lead, the campsite will be filled with lots of our fluffy butts. Some dogs may be slightly nervous or anxious, others may be over-excited. We want everyone to feel relaxed, after all, this is a new place for us with lots of things to get over excited about. Also, if you’re anything like me, I pretend to act deaf if I find a smell way more interesting than my Mam! Lucky Pup Design have some stylish collars and leads for you to pick up. The collar I’m wearing is a tweed fleck collar which has reflective detail on it – perfect for the nights at the campsite. The collar is 100% Pure New Wool and made to repel water and dirt. Also, check out my lead, very ‘on trend’ right? It’s made from fine durable acrylic twine to allow for some stretch! A dog screw is also useful to use with a longer lead. You will be able to screw it into the ground in a suitable place, attach us to it and relax fully knowing that we can’t wander off into the woods. A key essential! At the Top of the Woods within the glamping accommodation, our furry paws are not allowed on the fresh white bedding. So be sure to bring a bed to pop by the side of the bed for close comfort. Lucky Pup Design have a glorious range of double-layered luxury blankets, made of wool, velvet, linen, denim. What’s more? They’re all completely reversible. My humans tested these blankets in the great outdoors and I instantly had a mid-photo shoot snooze. They’re super snuggly and come in a range of sizes! Some of us are mucky pups, fortunately for my Mam I can stand the sight of mud or water. That being said if I get caught in the rain I’m gonna need a bit of drying (while looking very sorry for myself of course). A towel can also be useful if heading to one of the glorious beaches nearby! Also, dog or baby wipes always come in handy for so many things. This seems a little obvious, but us furry kind have to stay hydrated and fed. Especially when we’re having a spot of freaky British sunshine! A travel dog bowl and water holder is definitely an essential in my suitcase. I think my humans picked this collapsable one up at TK Max but they’re easy to find online! You may also want a lil feeding matt to collect any bits of food we might drop (save us snooping in the grass to find it). Lucky Pup Design have a retro stone washed denim and cotton poplin lining place mat. This is the perfect accessory to roll up and take with you wherever you go. Sorry humans, it’s a dirty job but someone has to do it (usually Dad in our case). Picking up our poo is essential no matter how smelly it is! When staying in a place of beauty such as Top of the Woods, it’s impawtant to keep the site and surroundings clean for the next dogs and humans who visit. We care about looking after our environment, so in my suitcase we’re popping in some biodegradable bags. Now if you know me, you’ll know how much I love to rock a bow tie or new bandana. However, last time I visited Top of the Woods, I found myself getting a little chilly in the nights. So this time I’ve been searching for a coat to keep me snug, and Lucky for me, I’ve found a beauty! Lucky Pup Design made a tailor made denim jacket for me to rock at the campsite. I even have a reversible wool one to enjoy packed in my case too! Plus, we want to be on fleek for our favourite dog photographer Tom Harper right? We just love to play! Whether it’s with a tweed and cotton bone like the one from Lucky Pup Design, a tennis ball or your favourite toy. Not only that, but we also love our home comforts. Having my favourite toy or something familiar on hand helps to create a comforting environment. In my suitcase, alongside the lovely bone toy, I’ll be taking my lil squeeky monkey and a Charlie sized tennis ball for chasing. Check out one of our previous blogs with some DIY enrichment games you can even create and bring to keep the brain moving. So there you have it, my packing essentials. 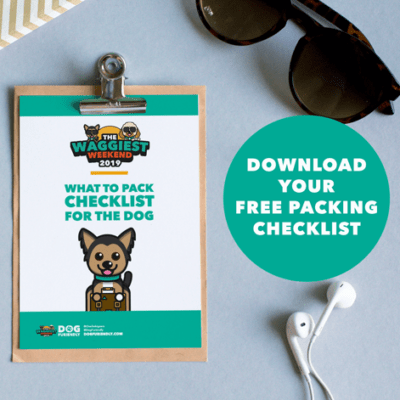 Of course there’s lots more things you could take, I’ve included one or two in my downloadable packing checklist. This list is pawfect for those joining us for the Waggiest Weekend, or for anyone camping or glamping this summer. PHEW! Now, I’m off for a lil snooze and a bite to eat. All this writing is hard work (and I’m totally due a few treats right?). Check out these holiday snaps from our last trip to Top of the Woods!